Fighting the fire of 1897. To the right, the Cowan McClung & Co. (now H.T. Hackney and The Market). From the ashes of the fire, rose many of the iconic structures we see today on the 300 and 400 blocks. Identifying them by their current businesses, the buildings that hold Sapphire, Downtown Grill and Brewery, the Art Market, the Phoenix (Clayton Bank), and Mast General Store were all built as replacements to the structures that burned in 1897. Walking that block however, one cannot help but notice the large hole that follows Mast General Store. The question of how that hole developed will lead us to another fire, but first, let's take it from 1897. Perhaps the biggest loss of the fire of 1897 was that of the Daniel Briscoe Company, losing over $300,000 of stock. The company's namesake, Daniel Briscoe, was a former confederate solider who had come to Knoxville by way of Morristown. He was a classic "jobber," operating in the wholesale buisness. His company operated its headquarters at 322 S. Gay Street, rebuilding after the fire of 1897 and again after the fire of 1904. Mr. Briscoe retired in 1909 and his company reorganized, moving to a new Jackson Avenue location. Enter 1930, the Briscoe building underwent a huge reconstruction or re-purposing. 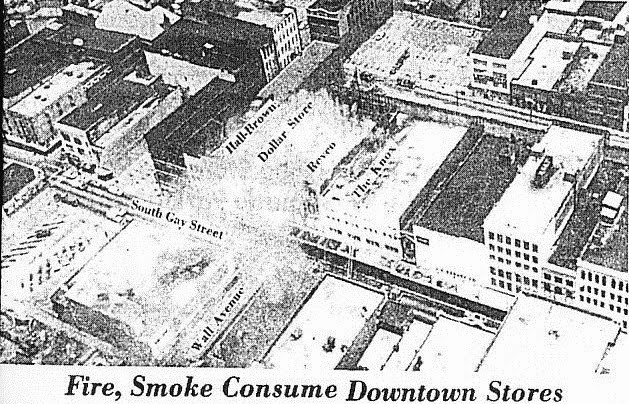 The Briscoe building was hollowed out on the bottom floor, with the middle-south bay forming an arcade. This served as a pass-through to the building's namesake purpose, a terminal for the Union Bus Company. The Terminal Building under construction in 1930. 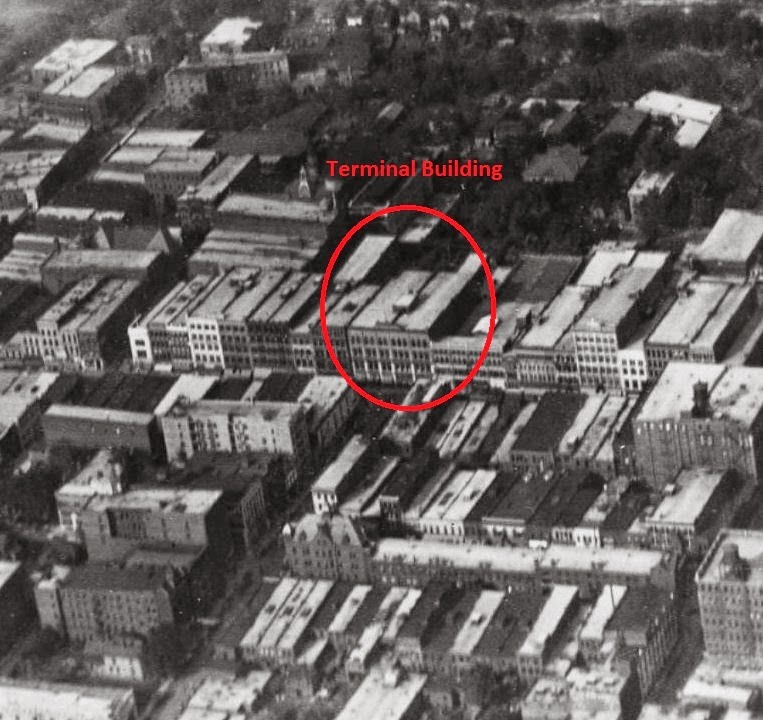 The Terminal building was an imposing structure visible along Gay Street and forming the terminus to Wall Ave. If one were leaving Market Square, The Terminal would fill their view. The Terminal Building was an Art Deco design. It was a brick shell construction, utilizing walls from the earlier Briscoe building, with a stone facade. Perhaps the most striking feature was the lattice work which decorated the window arches and arcade entry. 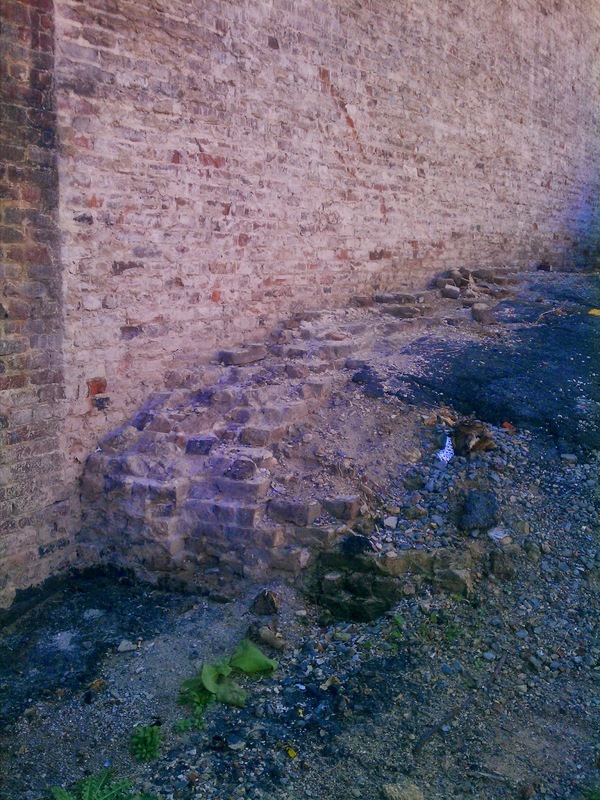 Finished in 1931, the building standing on Gay Street served as a pass-through to a bridge over Fire Alley. That bridge led to another building which served as the waiting rooms and staging areas for the Union Bus Company, which later became part of the Greyhound Bus lines. An advertisement from a UT Volunteers football program, 1944. Standing on State Street looking west towards Gay, buses waiting to depart the Union Terminal. Buses departing for Bristol and Chattanooga. There were lines to Atlanta, Chicago, Washington D.C., and most other large cities. Intercity bus traffic eventually moved slightly north of downtown after the consolidation of bus lines into the the huge Greyhound Company. Greyhound built their new "modern" terminal at the corner of Central and Magnolia on U.S. Highway 11. With rail traffic in sever decline, this became the new gateway to Knoxville. 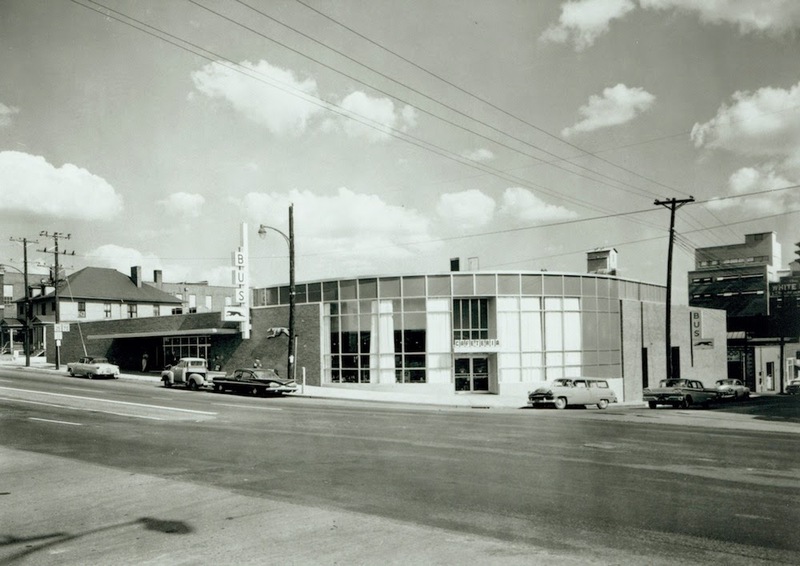 The Greyhound Bus Terminal circa 1960 (still operating). The Terminal Building served a much larger purpose than just the entry to a bus station. 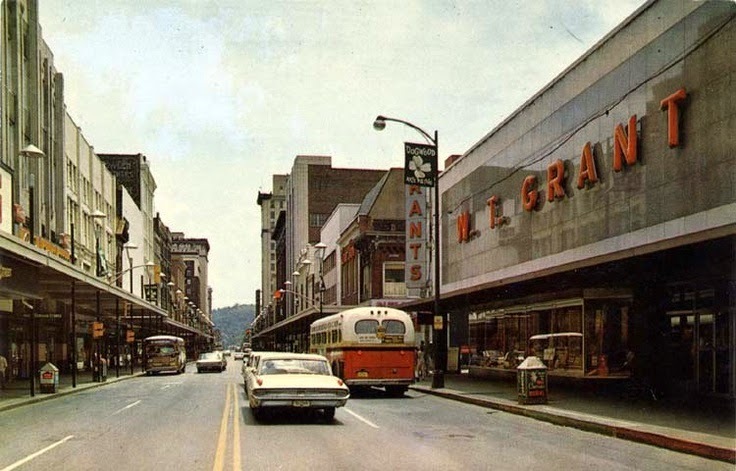 It was also home to Knoxville's first, full-sized Sears Department Store. 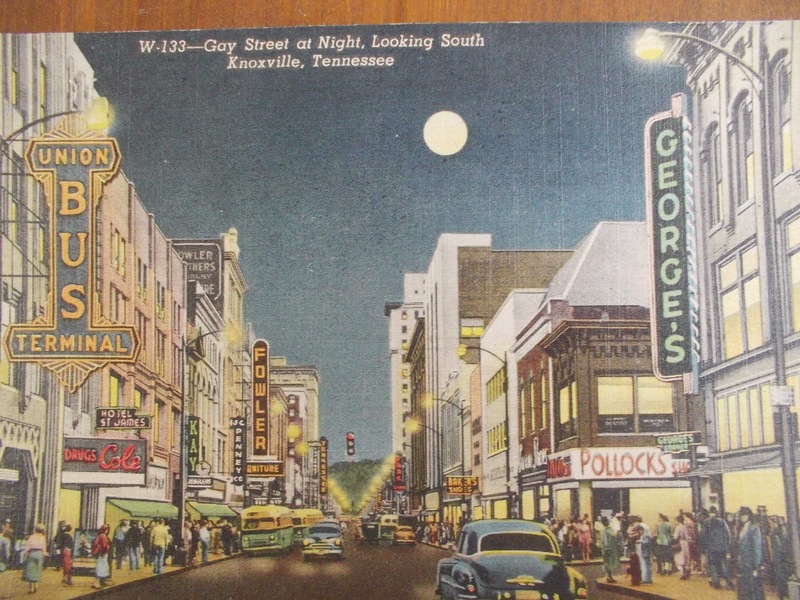 Sears came to Knoxville in 1928 and located at 520-522 Western Avenue. That was a small, farm and hardware only store. 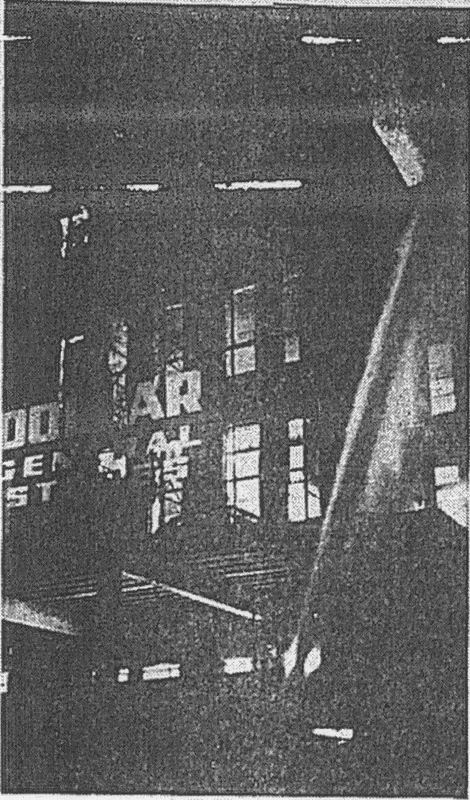 Sears realized that Knoxville would be an ideal market, so the moved to the much larger location at 322 S. Gay Street in 1931. The Terminal Building with Sears announcing its coming store. Sears, Roebuck and Co. "The Thrift Store of a Nation"
Sears, Roebuck & Co. after opening. Just look at those tools! Do you think Craftsman guarantees that plow and collar? Sears operated in the building until at least 1947, opening a new "suburban" store on Central Avenue in 1948. That would become their main store. The other original anchor of the Terminal Building, operating in the south bay, was Cole's Drug Store. The Cole Drug Co. was started in Knoxville by Robert H. Cole and eventually became a regional chain. 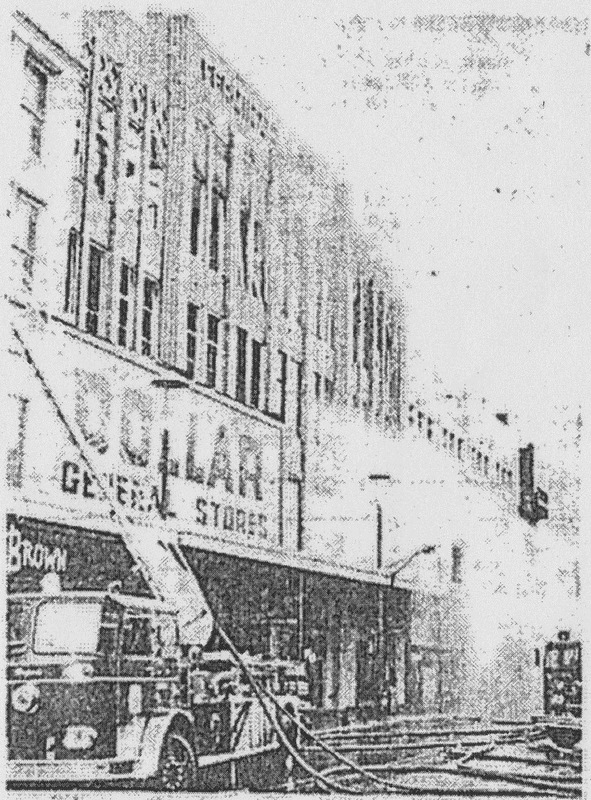 The company once operated a store in the Kern's building on Market Square. The Cole Drug chain was still in existence in the 1970's. The Terminal Building was a perfect example of a multipurpose structure, serving commercial needs and as a transportation hub. 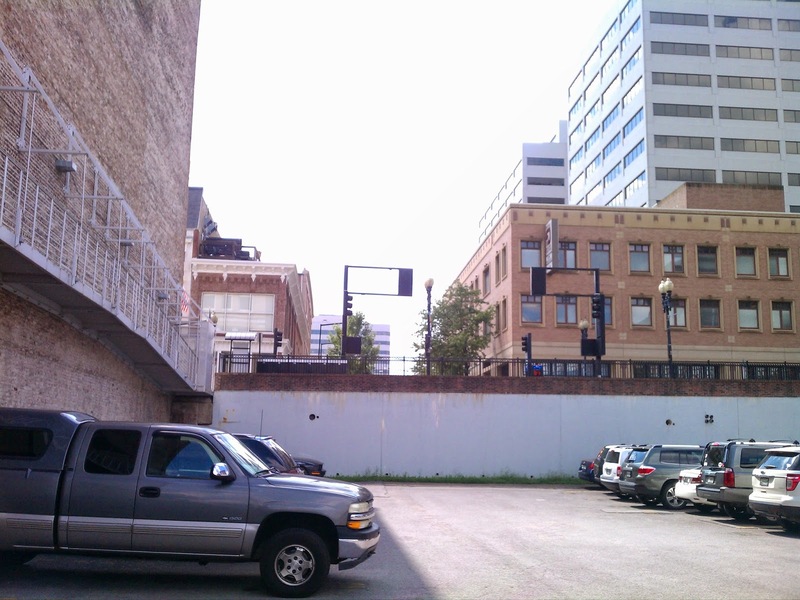 So what became of the building and why does Knoxville now have this large gap in the most cherished block of its most cherished street? Here we see the Terminal Building in the 1950's still operating much as it did in the 30's. The bus station is still in place as is Cole's. Of course, these illustrated images tend to paint things a bit rosier than they actually were. The following are from the Tennessee Archive or Moving Images and Sound's film of the 1947 Last Streetcar in Knoxville. We can see from the film that both Sears and Cole's were still in place in 1947, as was the bus terminal. The scenery looks a little more dingy than in the postcard view above. It is also notable that the JCPenney's building is already covered in its shiny modern skin that would remain until the late 2000's. From the 1960's. Terminal on the left. Below is perhaps one of the last photos of the Terminal Building while it was still standing. It was taken in the late 1960's/early 1970's. 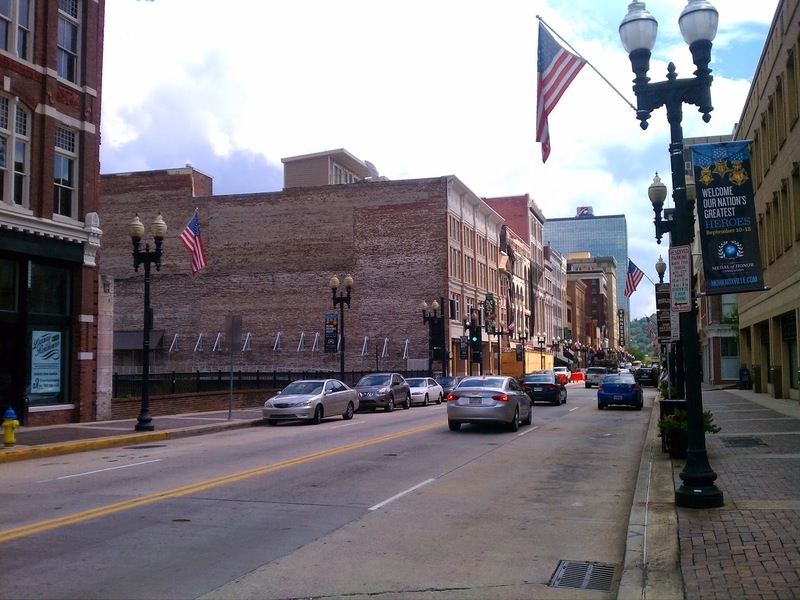 Photo taken by M Jacquelyn Patterson (from left to right the Century Building (Credit Plan), the Sterling-Cruze building (Jones Music), Hall-Browns, The Terminal Building, Knox Department store, JCPenney's, Fowler's). Here we can see that during the 60's the businesses have changed. The Terminal Building (right) houses the Dollar General Store and a Revco pharmacy. Long gone are the buses. 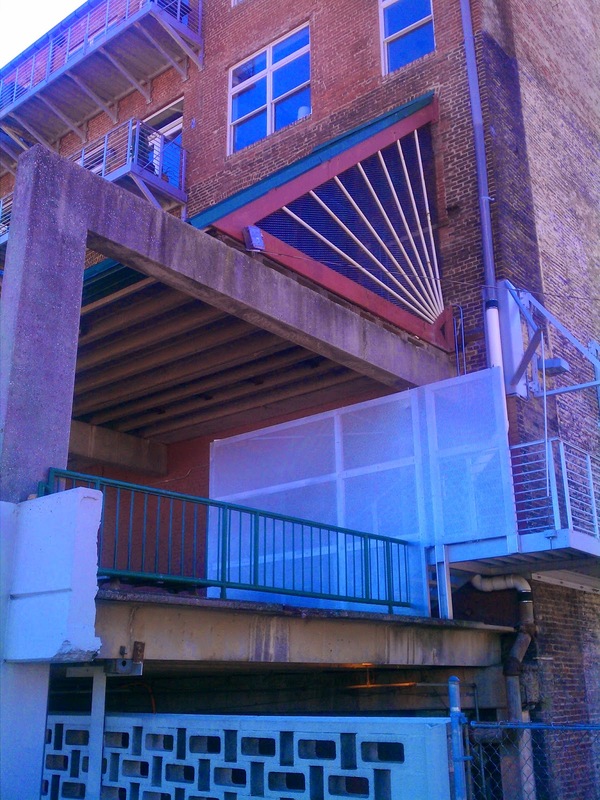 You can see the awnings that formed the 1960's urban renewal project, the "Gay Way." Downtown is beginning to look a little down and out in this photo, but not nearly as down as what was to come...the end of the Terminal Building. We began by discussing the Million Dollar Fire of 1897, but almost nobody today discusses the 3 Million Dollar Fire of 1974! 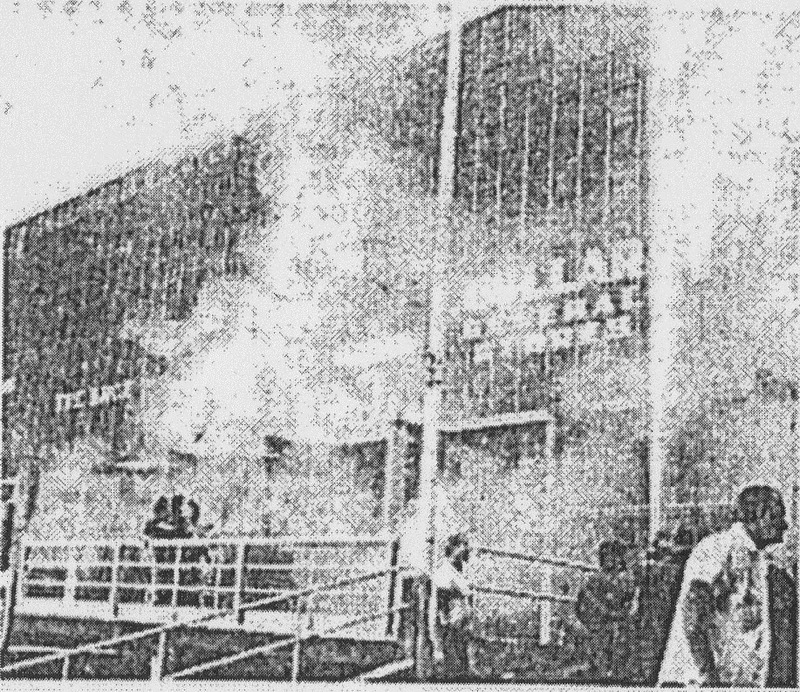 In the early morning, Sunday, July 22, 1974, smoke was noticed coming from the rear of the Revco Drug portion of the Terminal Building. The fire department was on the scene some two minutes later. 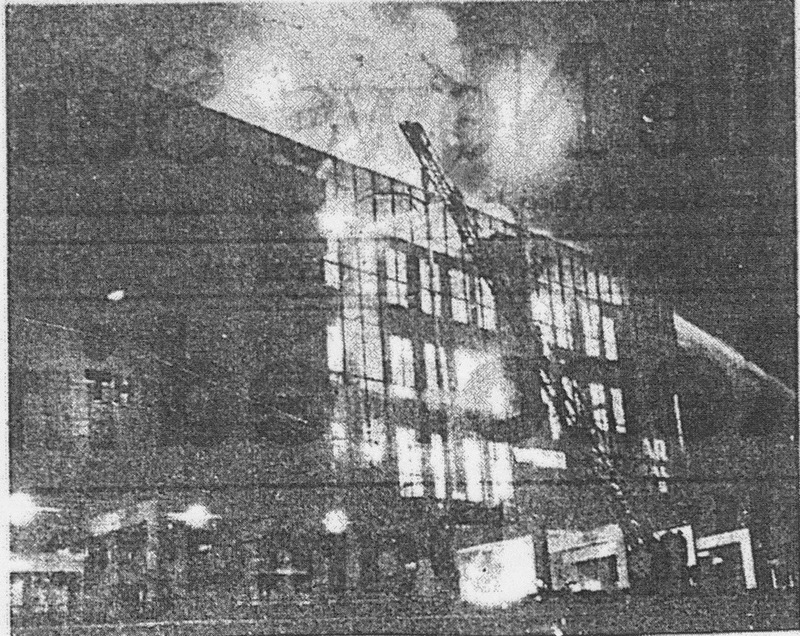 Firemen entered the building from the front and from below the Promenade, at the rear. The fire chief, Bill Potter, noticed that the first floor was about to collapse, so he ordered his men out with seconds to spare. The floor fell and the fire "mushroomed" out the front and rear of the building. Two firefighters were thrown and injured. The flames traveled upward until they were sailing high into the dark sky. 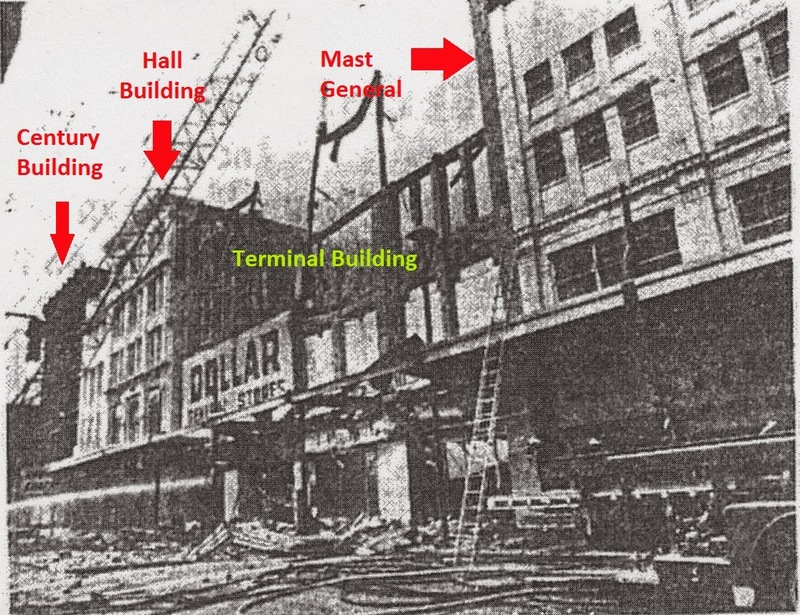 When the fire was extinguished, the Terminal Building was a burned out shell. Its neighbors, The Knox to the south and Hall-Brown to the north, were severely damaged by smoke and water. A second floor wall in The Knox (Mast General) caved in. 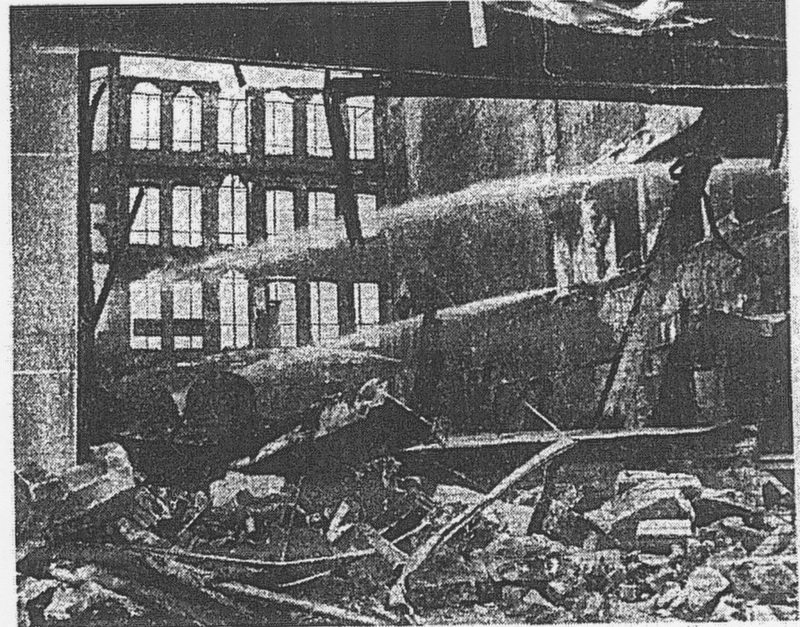 The remains of the Terminal Building were ordered demolished that day. Interestingly, the property was still owned by the Daniel Briscoe Estate at the time. From the rear, note the angular columns of the promenade. The burned out interior of the Terminal Building. 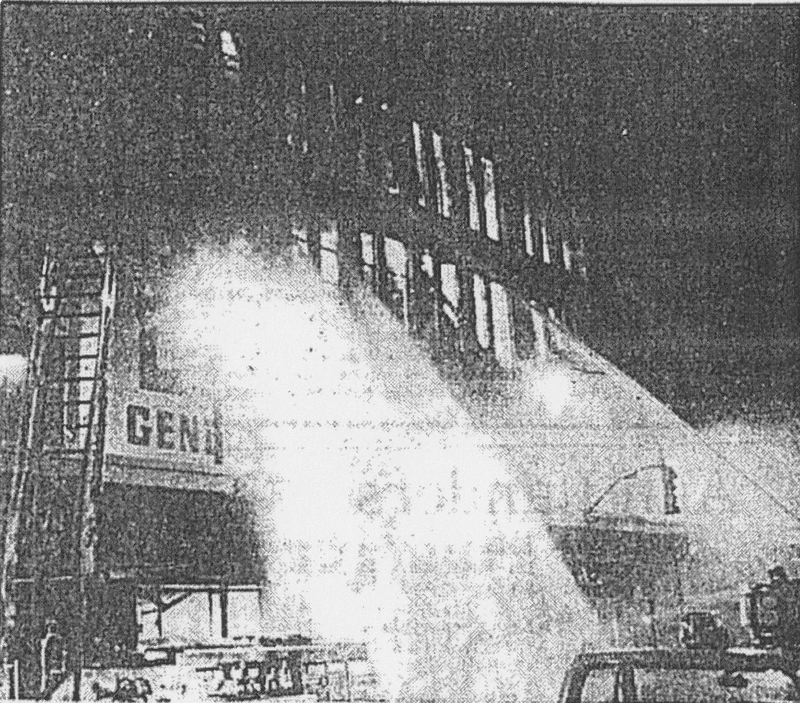 The fire of 1974 was reported to have cost $3.5 Million in damages. Lables to put the fire in perspective. The next day brought the demolition of the Terminal Building and its neighbor, Hall-Brown, too damaged to remain. Somehow, the damaged Knox lived on and now houses Mast General Store. The Century Building remained, having survived this fire and the fires of 1904 and 1897. The Century Building and Taylor Lofts both date to the 1880's and are the oldest on the block. The following is a photo of the rear of the block when it was remade into "The Promenade" in the 1950's. Something that many who frequent "The Promenade" may never have noticed is that it used to be 5 arches longer before the fire. The parking area behind "The Promenade" mysteriously extends well beyond the current structure. Note how the concrete rail is roughly sawed off. It used to extend 5 more spans. Finally, a note on Hall-Brown, also destroyed by the fire. Hall-Brown, formerly Hall's, was an upscale men's and women's clothing store. 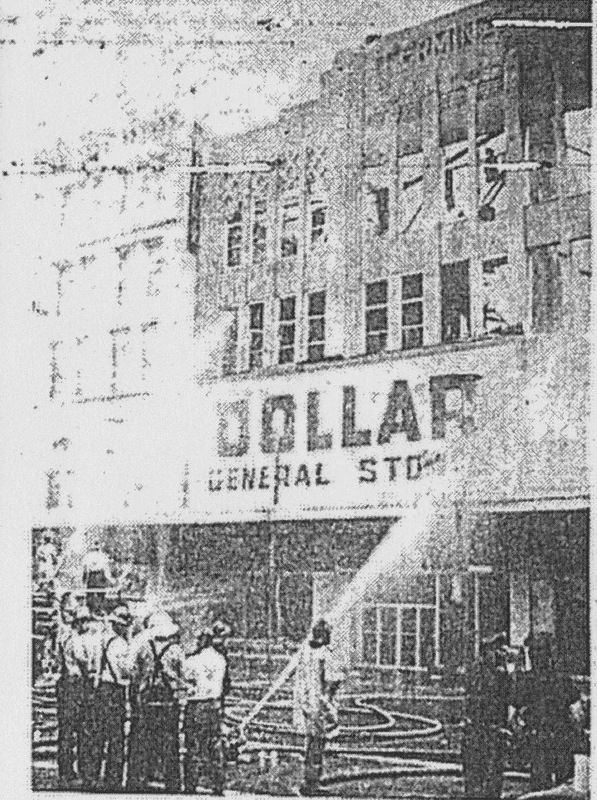 It was one of Knoxville's oldest clothing retailers. Hall's "On the Square" on Gay Street. Hall's to the right, Century to the left. Note that this little "jog" in the Gay Street sidewalk still exists. 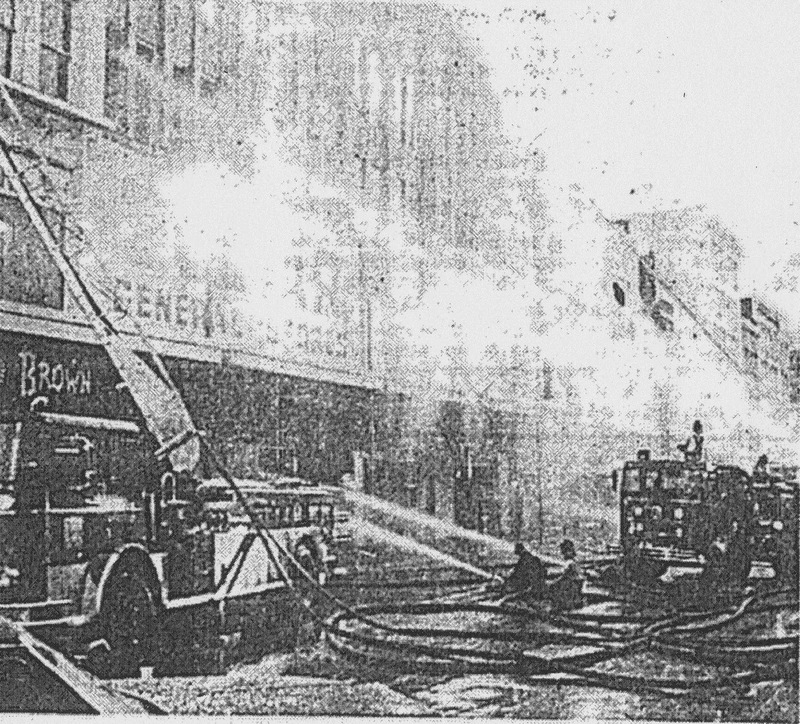 As it turns out, the 1974 fire on Gay Street was not a freak accident. The next day the police had a suspect, Jerry Wayne Penley, a 19 year old, former city employee.. The police picked him up on tips that he had been setting fires, though much smaller ones. He was referred to in the papers as a pyromaniac. He pleaded guilty to the charges a few weeks later and was sentenced to 5-10 years in prison. So, the story turns out to be one of the intentional destruction of the beautiful spaces of Knoxville. This time it was at the hands of an arsonist, but when you look at what was lost is it really much different when the destruction comes at the hands of a demolition crew? In the end, another surface parking lot prevailed. There will be more "Gaps of Gay Street" to come...stay tuned. Once again, an excellent article. Thank you for getting back at it. We need what you do. I love this! I'm so glad to find it and to see the buildings I knew so long ago. In the 1940's when I was a little girl Mama and I used to go with my Navy brother to the Terminal and see him get on a bus to go back to base. He would always ask her not to cry, but she would. He said it made it so hard when she cried. I used to ride a bus from there too, to Rockford to see his wife. Thank you so much. This is very interesting. Look forward to reading more about the history of my city. Keep up the great work! This is well planned, documented and presented. 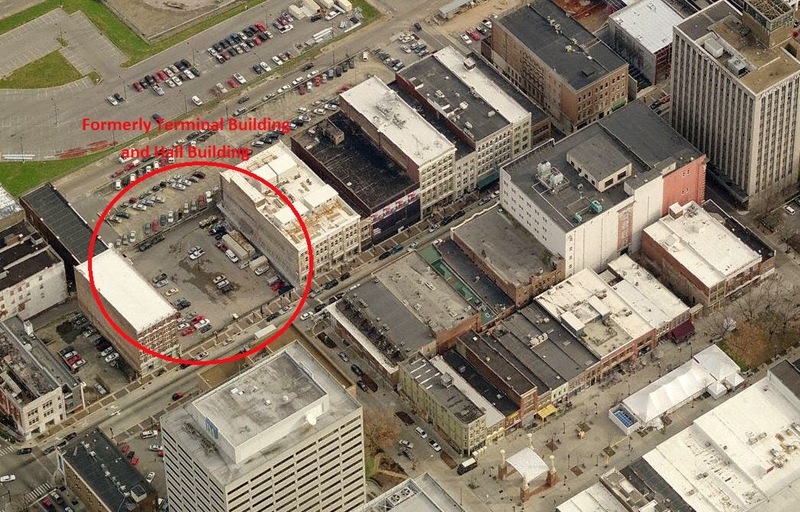 Please explain the history behind the other vacant spaces (AKA parking lots) on Gay St. It seemed like Gay St. was twice as long and had 4 times the stores when I was a kid. I really enjoy reading your posts! Excellent, well researched post! Please keep up the great work! I remember the Terminal Building. I loved walking through the arcade I can remember those wooden benches like yesterday. After buying our bus tickets, we would go downstairs to catch our bus out Clinton Hwy. to Powell. You've certainly outdone yourself with this post. Really well constructed. What's a bit odd is that I had become somewhat curious over the last half year about the gaping hole at Wall Street and had been delving into the images on the McClung digital archive site--many of the same images that you included. However, I had not known about the fire in 1974, so that explains a lot. Also a bit odd is that I had imagined a new structure on the site that combined an arcade-like interior of shops that allowed pedestrian access to State Street. It's funny that the Terminal Bldg actually did that originally. Again, thanks for your work--please continue! Long time reader, first time poster. Just wanted to say that this was a fantastic article. Thank you for this article. Very informative and entertaining. 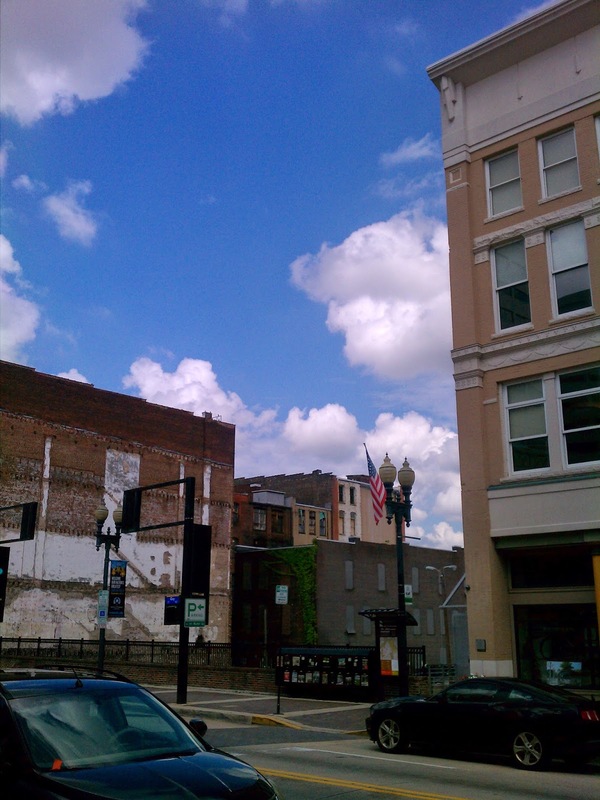 Knoxville Tennessee is a great city and interesting to know more about. Very interesting! I remember catching a Tennessee Coach bus at the Terminal Building as a child. Trailways later bought that company and built a "new" terminal on Main St., across the street from the current City County Bldg. We always used TN Coach because Greyhound would not make local stops along the way, just went from town to town non-stop. Oh, the memories!!! Yes, I'm an old lady now, and I remember the Cole's drug store, also remember when they changed to Revco and now CVS. As a young adult, I did LOTS of shopping at The Knox, and we also enjoyed Federal Bakery before they closed in the 60s. Thanks for the trip! Was the radio station in the building where the bus station was? I remember going to the radio station with my Mom while we waited for the bus to take us back to New Market. Interesting that Manley and Young, Architects, the designers of the 1930 re-purposed Terminal Building, were also the architects of the Medical Arts Building on Main. Fascinating article. 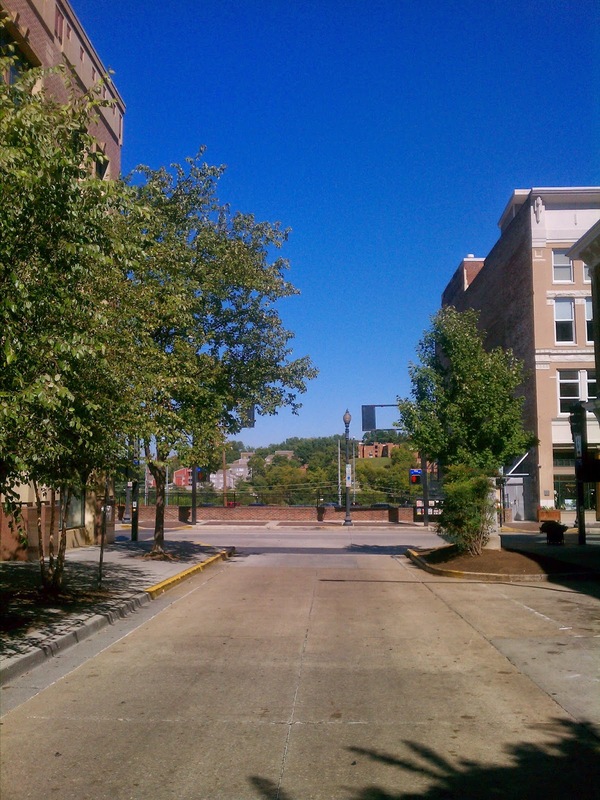 I lived in Knoxville from 2006 to 2013 and love to hear about the history. Thank you. Rode Greyhound from Philadelphia, Tn. 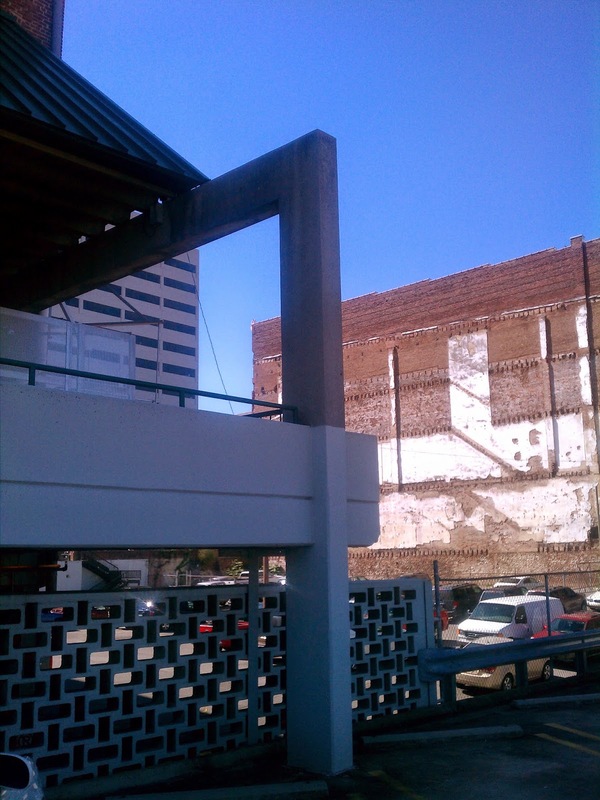 many times and was fascinated by all of the gashes on the building wall where the bus entered (from Gay Street) the very narrow passageway as you arrived "under" the station to exit for your adventures into downtown Knoxville. Exhaust fumes sometimes filled this area and you hurried to climb the stairway to the interior of the bus station. The time period 1945 - 1953 (when I most remember making the bus trips to Knoxville) found Knoxville to be a very crowded city with policemen directing traffic at almost every stoplight. After an exciting day it was time to "catch the bus". However, a ticket had to be purchased (ticket station was on the left), maybe a trip to the restroom (some 5 cent, some free stalls), a quick sandwich and 5 cent fountain drink at the lunch counter, and you waited until the pa system announced "bus now loading on track 4 for Farragut, Lenoir City, Loudon, Philadelphia, (many other stops on way to final destination of Chattanooga)." 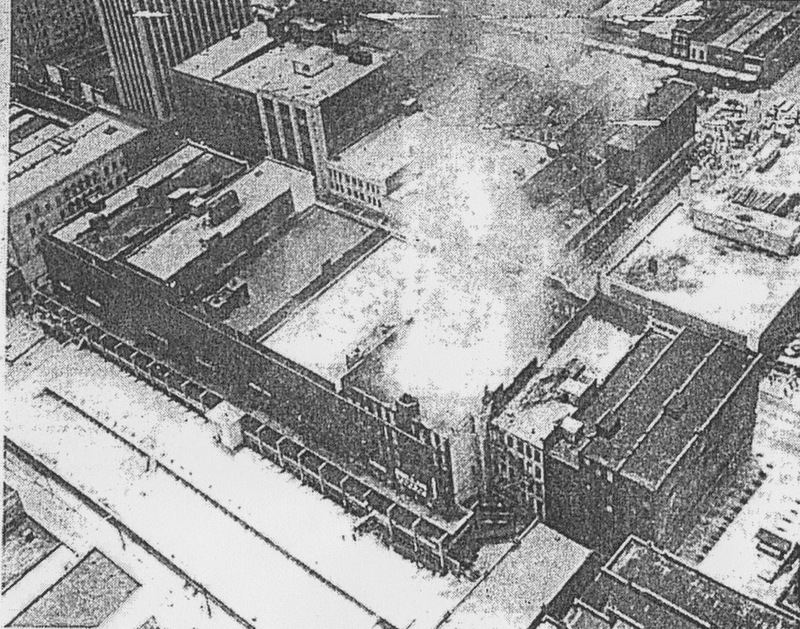 Wasn't the 1970s fire on Gay Street mentioned in your post in 1973? Your excellent article uses both 1973 and 1974 dates. 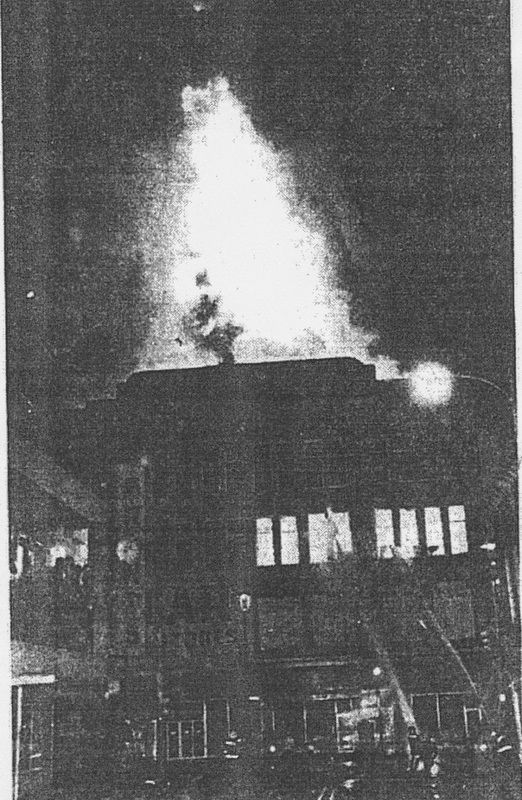 The fire was Sunday, July 22, 1974. You caught a typo in one of the photo captions. I have fixed it. Thank you! Do you know anything about the dental offices across the street from what is now Mast General Store? The entrance was on the side street, Wall, I think. And in small tiles on the entrance was spelled out HAMILTON. My grandfather was the dentist, S. B. Hamilton,Sr. The offices were upstairs and part fronted on Gay St. We used to go there to watch the Santa Claus Parade and keep warm. I think he died in 1948 but the offices were kept open for newly graduated dentists to get a start in the world for many years. Now, the offices are apartments. I just now found your fantastic blog and plan to spend a lot of time reading through all your posts. I grew up there in the 1930s-50s so many of the names and places are so familiar. Regarding your post on McGhee: Surely he was the McGhee of the McGhee-Lawson Library? I'll be looking for a post on that structure since I spent much time there as a youngster. Thank you so much for your wonderful blog. I suspect I will become one of your most avid fans. Rereading your piece I see the library was named for his daughter. Surely, then, he contributed money and/or books? Or the lions? So far I haven't found your piece on the library but I'll keep looking. Excellent article! I came "the other way 'round" to the interest in your beautiful city. Through music. I first saw the picture on the cover of the amazing wonderful Bear Family 4CD Boxed set "Knoxville Sessions 1929-1930", then i started wondering how this corner of Terminal Building would look like today. Never been to Knoxville, nor i have been in America at all, but i love the old music history of your city. Regards from Switzerland.